By pure chance one day in a conversation, long time baseball and wine enthusiast Pete Bush picked up a bottle of wine by its neck, turned it over and held it up to his shoulder like a baseball bat while pondering aloud, "I wonder if there is a wine bottle holder where the bottle is held as the bat in a batter's hands?" When he couldn't find anything even remotely like he was looking for, the idea for The BamVino was born. After much trial and error, Bush teamed with famed Louisiana sculptor Patrick Miller to create the prototype with great attention to detail and authenticity. 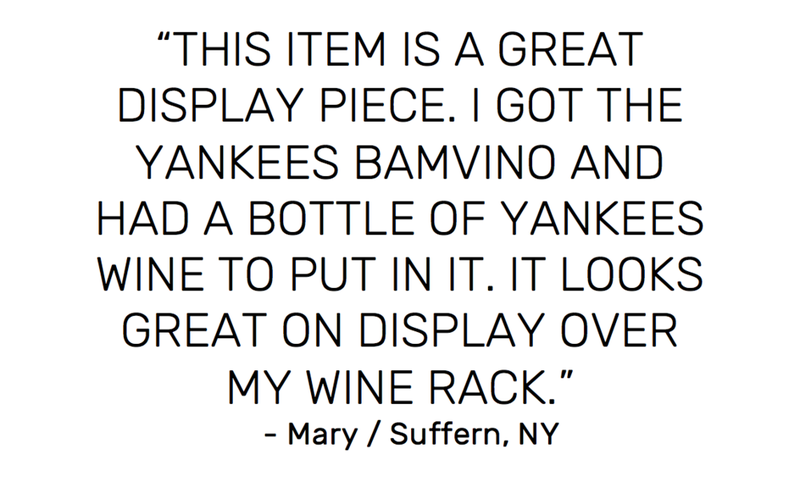 The result is a conversation piece wine bottle holder that sits on a wine bar or countertop and comfortably holds most standard bottles of wine. A former first baseman for national college baseball power LSU during their first three trips to the College World Series in the late 80's, Bush's initial idea was to produce The BamVino in the likeness of an LSU player and a generic bronze version, as well. As interest in the product has grown, the BamVino is now licensed with MLB and new teams are being added to the lineup.